He also said America was great because people have the ability to worship freely. Trump also said that terrorism was “one of the gravest threats to religious freedom.” He condemned the recent terror bombings by the Islamic State in two Egyptian Coptic Churches. “We condemn this barbaric attack. We mourn for those who lost loved ones and we pray for the strength and wisdom to achieve a better tomorrow,” he said. You can see the 3.5-minute video address here. Click here. Haven’t heard the President speak like that in over 8 years!! God Bless President Trump!!! Greatest message of Easter I’ve heard outside of church. And the liberal democrats will go right on trumpeting. 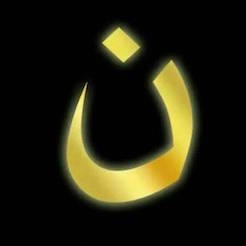 And ABC NBC and CBS will continue to ignore the Christian genocide in the Middle East. Just what the liberals want. Make religion – of course they mean Christianity – a private matter only. 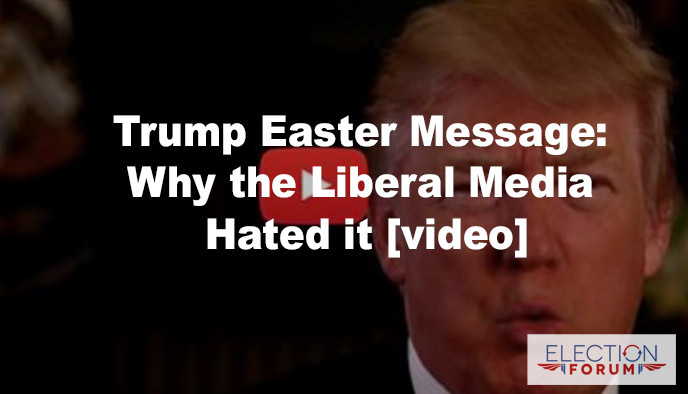 this Easter message is one of the greatest speeches I have heard in a long time. It makes me feel proud and have hope again in a Nation that was founded on God. Praise God that he is with our president and may he ALWAYS listen to the voice of God. I keep thinking that the liberals are making such a hassle of everything but when I remember God is in control I KNOW that things will work out. God bless you Mr. President and GOD BLESS AMERICA. God Bless a America land that I Love. Thank you Mr President for your great words. May God watch over you give you wisdom. a President that acknowledges Him at every turn. PTL! The way I see it, if Trump isn’t a Christian, he will accept Jesus soon, it is inevitable. God IS in control: Hallelajah! Ephesians 6 says that we wrestle not against flesh and blood but against principalities powers and rulers of the darkness of this world and wickedness in high places that is why we have the stiff resistance we do with Trump and things that really matter . The more Trump talks against the UN, for Israel, religious freedom, anti Muslim incursion, America first, and pro Easter, God, the more stiff the resistance and the more enraged Satanic forces get. Don’t be surprised. THANKS TO GOD FOR OUR PRESIDENT, DONALD TRUMP!!!!!!!! Liberalism is not an illness, it is plain old ugly sin in the hearts and minds of sinners. We need to pray for all sinners. Well said, James, SgtMaj USMC (Ret)….We should not be surprised at all from unbelievers actions because they are controlled by the God of this world…satan! What a pleasure to hear this speech on Passover and Easter by our President and to hear him recognize the importance of America being a land of believers. Thanks Craig for posting it. Through a bizarre turn of (so many) events, the Lord, by His grace, saw fit to encourage our nation, through President Trump, to continue to be a beacon of His light in a dark & dying world. I thank and praise the Lord Jesus Christ for His great hand of mercy, grace and blessing upon us. May the Lord bless President Trump, for his powerful and unashamed dependence upon God…for strength & wisdom. The Lord certainly HAS blessed our nation. May our nation, in turn…bless Almighty God!